The sounds produced by closure of valves of the heart are best heard not directly over the location of valve but at regions situated some distance far from the valve in the direction of blood flow via them. 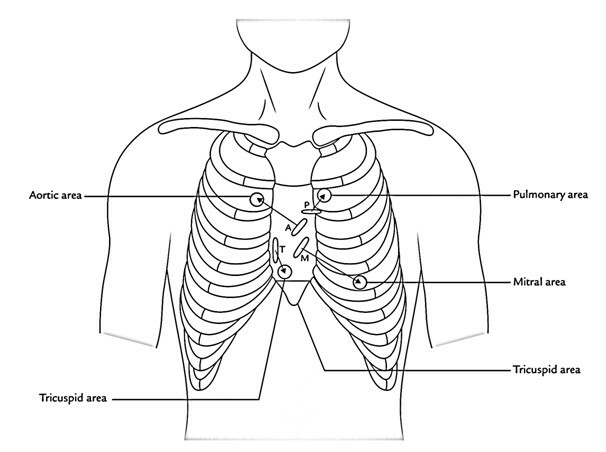 The pulmonary, aortic, mitral, and tricuspid valves are located posterior to the sternum on an oblique line joining the 3rd left costal cartilage to the 6th right costal cartilage. Blood tends to carry the sound in the direction of its flow, consequently auscultatory area lies superficial to the vessel or chamber via which the blood enters and is in direct line together with the valve orifice.